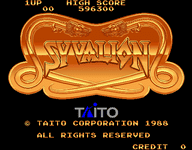 "Syvalion​ (サイバリオン) is an arcade video game released by Taito in 1988. The player controls a metal dragon with shooter gameplay. This game was designed by Fukio Mitsuji, creator of Bubble Bobble." Source: Wikipedia, Syvalion, available under the CC-BY-SA License.